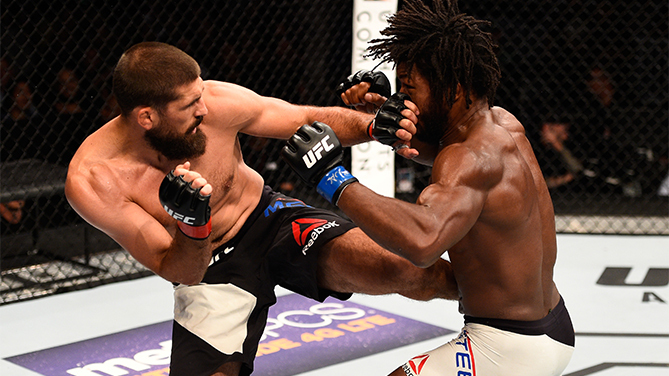 In Court McGee’s first bout as a UFC fighter in his home state of Utah, it looked like he was going to have an early night at Vivint Smart Home Arena in Salt Lake City on Saturday. But instead, he was forced to dig deep and go three hard rounds with Cincinnati’s Dominique Steele, who he defeated via unanimous decision. Scores were 30-27 and 29-28 twice for McGee, now 19-5; Steele falls to 14-8. McGee’s first right hand staggered Steele and allowed the local favorite to get a takedown. McGee immediately took Steele’s back and sought a rear naked choke. Steele hung tough and got back to his feet, and with under two minutes left, he scored with a crisp combination that rattled McGee briefly. Steele’s strikes hit home again early in round two, setting up some grueling grappling exchanges against the fence. McGee did get a takedown, but Steele jumped right back up, and the two resumed their grappling battle on the fence. The punishing and bloody back and forth action continued in the final five minutes, McGee getting a pivotal takedown as he avoided Steele’s bombs. 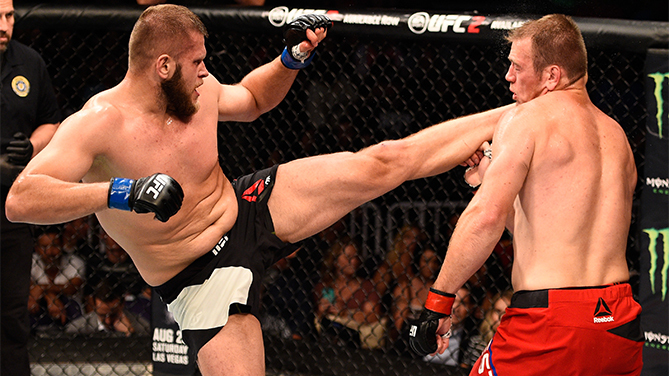 Polish heavyweight Marcin Tybura earned his first UFC victory in his second try, bouncing back from an April loss to Tim Johnson with a second-round knockout of the Czech Republic’s Viktor Pesta. Tybura had an impressive first round, his strikes and takedown defense keeping Pesta from getting anything going offensively. The second frame was following a similar pattern until Tybura switched things up by going upstairs with a left kick to the head. That was all he needed, as Pesta fell hard to the canvas, with referee John McCarthy immediately stepping in to stop the bout. The official time was :53 of round two. In lightweight action, Stockholm’s David Teymur picked up another knockout victory, finishing Portland newcomer Jason Novelli in the second round. 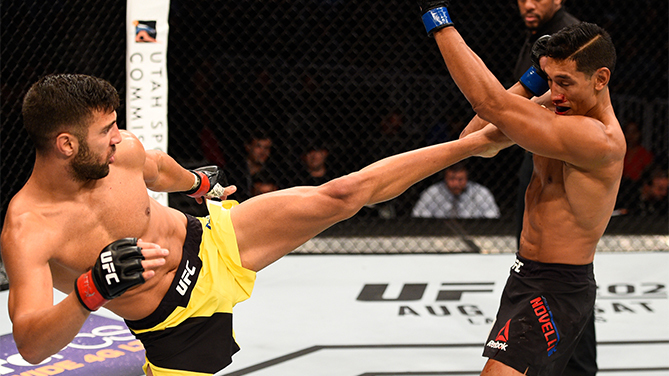 Novelli looked comfortable in the first round of his first UFC bout, but Teymur was the busier and more effective of the two, punctuating a solid frame with a left hand-induced knockdown with a little over a minute left. The Oregon product was more active as round two commenced, but Teymur’s left hand was still on target and deadly, producing a second knockdown. Novelli rose again, but the punches kept coming, finally dropping and stopping the newcomer with a right hand that brought in referee Herb Dean to halt the fight at 1:25 of the round. With the win, Teymur moves to 5-1; Novelli falls to 11-2-1. 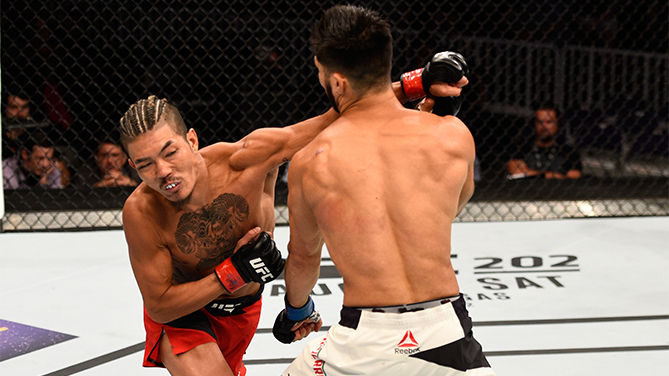 Japanese up and comer Teruto Ishihara delivered his second consecutive knockout win in the Octagon, halting Horacio Gutierrez in the first round of their featherweight matchup. While the two fighters engaged immediately, it took them a while to start hitting their mark, and when that happened at the midway point of the round, it was Ishihara who stuck first and struck the hardest, as he caught an aggressive Gutierrez with a left hook that put the Guadalajara native on the deck. Gutierrez tried to rise, but another left ended matters, with referee Dave Seljestad intervening at the 2:32 mark. With the win, Ishihara moves to 10-2-2; Gutierrez falls to 3-3.